Tribal and national leaders mourned the loss of Wilma Mankiller, who was the first woman to lead the Cherokee Nation of Oklahoma. Everyone from President Barack Obama to fellow tribal leaders to members of Congress hailed Mankiller as a true groundbreaker. They praised her for leading her tribe out of poverty to become one of the most prominent in Indian Country. "During her two terms, she worked to create jobs, break down social and economic barriers, improve access to health care, and address the roots of both rural and urban poverty. She led her people with dignity and grace, fostering a sense of community, cooperation, and shared values," former President Bill Clinton and Secretary of State Hillary Clinton said in a joint statement. Mankiller served as principal chief of the tribe from 1985 to 1995. She is credited for inspiring girls and women throughout Indian Country. “My daughter is only 10 years old, and she wants to be the Cherokee chief when she grows up,” Timothy Dunn, a receptionist at the Cherokee Nation complex, told The Muskogee Phoenix. Mankiller retired from tribal politics after her second term in office but continued to fight for Indian issues and women's rights. She was the recipient of numerous awards and honors, including the Presidential Medal of Freedom in 1998 and the first Sequoyah Institute Fellow at the Northeastern State University in 2009. In her later years, Mankiller struggled with health issues even as she maintained her public appearances. Last month, her family sent word that she was diagnosed with pancreatic cancer. 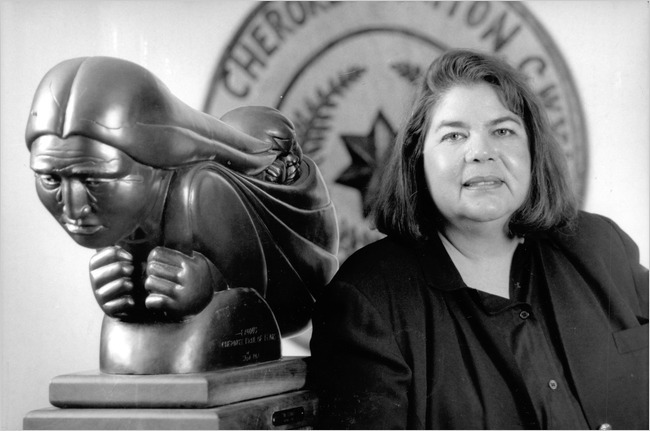 Mankiller was born born in 1945 at the Hastings Indian Hospital in Tahlequah, the capital of the Cherokee Nation. A memorial service is scheduleda t the Cherokee Nation Cultural Grounds in Tahlequah this Saturday at 11am.